Entry to Carradale This is the view as you arrive in Carradale having headed north from Campbeltown over a road which is a bit tortuous in places but which is gradually being upgraded. Carradale is geographically very spread out and this is the first main concentration of houses you meet. 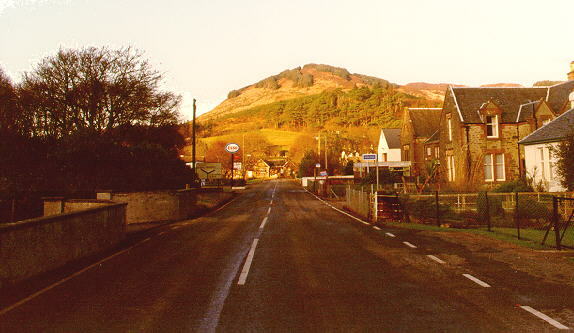 The building at the end of the road is "The Glen" bar, restaurant and shop. The main road curves sharply left just as you reach The Glen on its way further north, the road from here is entirely single track with passing places until you reach the village of Skipness some 15 miles further North. If you turn right at the Glen you are heading for the rest of Carradale Village, the bay and the harbour, and just a few hundred yards along that road drop into the Network Tearoom for a snack. Carradale really does have it all in just a few miles, wooded glens, isolation from the big bad world, sandy beaches, a harbour, a golf course, forestry walks, good food and good drink. This picture shows Carradale harbour on a cold but bright January winter day. The land mass to the top right is the island of Arran, and the stretch of sea to the left is the Kilbrannan Sound which runs between Arran and Kintyre and leads up the Clyde to Glasgow. Taken on a Friday afternoon the fishing boats are just returning home for the weekend, followed by a flock of gulls picking up the fish scraps thrown from the vessels. On the day that I took these pictures the light was not brilliant and as a result Carradale Bay and Carradale Glen which deserve to be shown have not been included - I'll go back in the summer and remedy this. 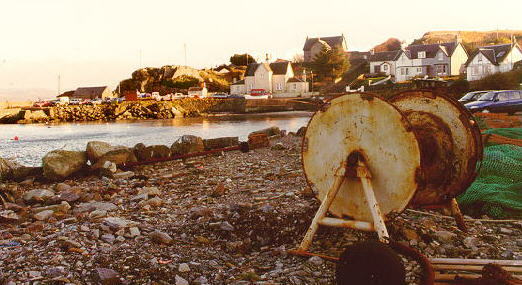 Carradale has always had a strong connection with the fishing industry, but in common with almost all coastal towns in Scotland the fleet sizes have been decimated in recent years leaving a fraction of the boats operating that there once were. Carradale tragically made the news some years ago when the fishing boat Antares was lost in the Clyde, her nets snagged by a submarine exercising in the area. Net snagging was until recently a far too common occurrence but with the fatal Antares loss a system was put in place to try to ensure fishermen and submariners were aware of each others presence. So far there hasn't been a repitition of this tragic incident. As mentioned earlier Carradale is very spread out and as a result it's very difficult to get one picture which captures the whole area. 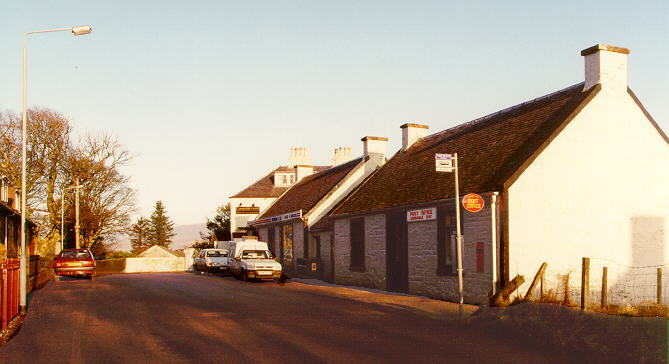 This picture of the village store is taken heading from The Glen to the Harbour. Behind the village store is the Carradale Hotel where you can stay if you wish to holiday here - which you should. Holidaymakers were, and still are, a major soure of income for the village, many tourists return to this beautiful area year after year on vacation. It's the sort of place that you fall in love with and just have to go back to regularly. It's not uncommon for locals to live in their houses during the winter and then rent them out to visitors in the summer. Round behind the hotel is the 9 hole Carradale Golf Course. Carradale is where my father (pictured left) was born and brought up. 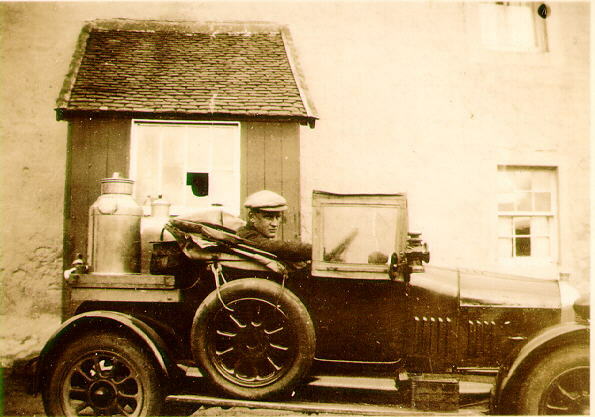 He lived on the nearby Auchnasavil Farm which sold milk to the the village and in this particular picture is seen with the milk cans onboard ready to go. This picture would have been taken around the mid to late '20s as he was born in 1907. Some time after this he left to go to Rhodesia (now Zimbabwe) where he lived and worked for 15 years. He married on his return home and I was born a few years later. Sadly he died in 1974 so I'll never know what he thought of having a picture like this of himself published on the internet - maybe just as well. When in Kintyre you're never far from the sea and the potential for catching a glimpse of marine wildlife is never far away. As a boy, making hay at my uncle's farm on the east coast, we used to look down from the hillside on the basking sharks just offshore in the Kilbrannan Sound.